Use these Tweet buttons to send a #ThePillKills tweet. Cosponsor The Pill Kills 2015? If so, please submit this form! From its earliest days, the development, research, and promotion of the pill were built on lies—lies which continue today. Women are irreparably harmed by those lies. Children are killed by those lies. And society hangs in the balance because America has not been told the truth. Here are the lies and the truth about the pill. Researchers ignored the truth about side effects and didn’t investigate the cause of women’s deaths. To gain FDA approval, large-scale human clinical trials of the pill began in 1956. Dr. Pincus chose Puerto Rico for the trials because of the large pool of poor, uneducated women available to him there. Even though the local doctor in charge of the study told Pincus that the pill causes “too many side reactions to be generally acceptable,” he ignored the warning and carried on the studies without investigating side effects. Three women died during those trials and the cause of their deaths was never investigated. The pill was approved as a contraceptive with no warning about dangerous side effects. In 1960, even though the FDA had initially questioned the pill’s long-term safety, those concerns were buried. The FDA approved the sale of the pill as a contraceptive with no warning about the side effects. It became the first FDA-approved drug to be given to healthy patients for long-term use and for social purposes. Medicine was no longer strictly a healing art. It was perverted by the use of drugs to deter, damage, and even destroy healthy female reproductive systems. Women with no conventional risk factors who use the pill have twice the risk of heart attack. Those with high blood pressure who use the pill have five times the risk of heart attack. Those who smoke and use the pill have 12 times the risk of heart attack. Those with diabetes who use the pill have 16 times the risk of heart attack. Lower dose pills increase the likelihood of pre-implantation abortions. Women are not warned. After the 1988 removal of the high-dose pill from the market because of its dangerous side effects, the amount of artificial estrogen was lowered in the new generation pills. This increases the chance of breakthrough ovulation and thus increases the likelihood of early abortions due to endometrial thinning. Women on the pill have light menstrual periods because the pill reduces the thickness of the endometrial lining, resulting in difficulty of implantation of the embryo, which can result in an early abortion. Women are told contraception prevents abortions. This is untrue on many levels. 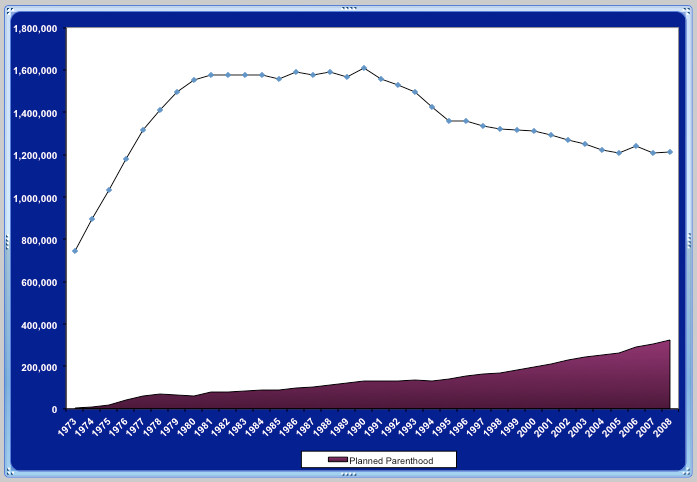 Indeed, as the chart below shows, the number of abortions in the US doubled between 1973 and 1981. Women are told the pill prevents some cancers, and overall is a negligible factor in cancer. But the research shows dramatic increases in cancer for pill users. In 2000, the National Toxicology Advisory Panel put the estrogen found in birth control pills on its list of carcinogens. There are metabolites of estrogen which directly damage DNA causing mutations and cancer. The International Agency on Research of Cancer, part of the World Health Organization, listed the pill as a Group 1 carcinogen in 2005. Long-term pill use increases the risk of cervical cancer. Women who use the pill for five to nine years have twice the risk of cervical cancer. Those who use it for 10 years or more have more than three times the risk of cervical cancer. Since 1975, the risk of in-situ (early stage) breast cancer has increased 400 percent in premenopausal women. Women on the pill increased their risk of getting an HIV infection 60 percent when compared to women not taking the pill. Women on the pill were twice as likely to transmit HIV to their partner. In an era where lies and obfuscation are used every day by media, government, and even religious institutes, only the truth will set us free. The pill kills the truth. It is time for the lies and obfuscation to end. Join American Life League in our Pill Kills National Day of Action on June 6, 2015, by organizing an event in your community. 1 PBS Online, American Experience, “Timeline: The Pill (1951–1990),” Public Broadcasting Service, http://www.pbs.org/wgbh/amex/pill/timeline/timeline2.html. 2 American College of Obstetrics and Gynecology, Terms Used in Reference to the Fetus (Chicago: ACOG, September 1965). 3 PBS Online, American Experience, “Timeline: The Pill (1951–1990),” Public Broadcasting Service, http://www.pbs.org/wgbh/amex/pill/timeline/timeline2.html. 4 B.C. Tanis, et al, “Oral Contraceptives and the Risk of Myocardial Infarction,” New England Journal of Medicine (2001), 345:1787–1793. 5 John Wilks, “The Impact of the Pill,” Ethics and Medicine (2000), 16(1):15–22, http://www.issues4life.org/pdfs/2000_theimpactofthepill.pdf. 6 Angela Lanfranchi, “The Pill Kills,” http://thepillkills.org/pdf/ppt_lanfranchi.pdf. 7 Robert Rector, “Marriage: America’s Greatest Weapon against Child Poverty” (The Heritage Foundation, 2010), http://www.heritage.org/research/reports/2010/09/marriage-america-s-greatest-weapon-against-child-poverty. 8 William F. Colliton, Jr., “Birth Control Pill: Abortifacient and Contraceptive,” AAPLOG, accessed 3-14-15, http://www.aaplog.org/position-and-papers/oral-contraceptive-controversy/birth-control-pill-abortifacient-and-contraceptive/. 9 Guttmacher Institute Fact Sheet, Induced Abortion in the United States (July 2014). 10 British Pregnancy Advisory Service, “Women Trying Hard to Avoid Unwanted Pregnancy, Research Shows” (Feb. 4, 2014). 11 “The Abortion-Contraception Connection,” Pro-Life Activist’s Encyclopedia (American Life League), http://www.ewtn.com/library/PROLENC/ENCYC097.HTM. 12 Angela Lanfranchi, “The Pill Kills,” http://thepillkills.org/pdf/ppt_lanfranchi.pdf. 13 STOPP International, “New Study: The Pill Doubles Risk of Brain Cancer” (American Life League, 2015), http://www.stopp.org/article.php?id=14582. 14 C.C. Wang, et al, “Risk of HIV Infection in Oral Contraceptive Pill Users: A Meta Analysis,” Journal of Acquired Immune Deficiency Syndromes (May 1, 1999), 21 (1):51–58. 15 S. Franceschi, et al, “Genital Warts and Cervical Neoplasia: An Epidemiological Study,” British Journal of Cancer (November 1983), 48:621–628.